Recorded at SoundSuite Studio in Marseille, France with producer Terje Refsnes (Tristania, Morgul, Turisas). Mastering duties were handled at Finnvox studios in Helsinki. I learned about Battlelore two years ago, by buying their second album, "Sword’s Song". The first thing I had at that time was “yet another power metal band that heavily draws on Tolkien’s works”. However, the album was not bad, with some very interesting songs (above all “Horns of Gondor”), although I felt too much computer programming in the mix. 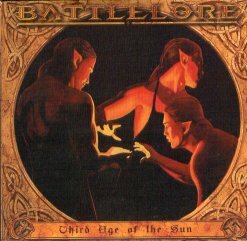 After a successful DVD live, Battlelore release this third album, called “Third Age of the Sun”, and again they focus on Tolkien. However, the line-up of the band is changed, especially with the loss of the singer / swordsman Patrik Mennander, which I think was quite a charismatic figure in the band. The new vocalist Tomi Mykkänen, however, is not a bad substitute, while the always charming and lovely Kaisa Jouhki in this album receives far more space than before. And I’m personally happy with this! The band is completed by Jussi Rautio on the lead guitars, Jyri Vahvanen on guitars, Timo Honkanen on bass, the mysterious Maria on keyboards and flute, and Henri Vahvanen on drums. The album opens, as it is nowadays consuetude in the power metal, with an intro (titled “Usvainen Rhun”), this time recited by the beautiful Kaisa. And the first true song of the album, “Storm of the Blades” while aggressively interpreted by the new grawling male vocalist Tomi Mykkänen, is a bit softer than I expected (inevitable is the confrontation with the opener of the previous album, “Sons of Riddermark”); however the song in itself will appease the fans of this genre, with the sharp contrast of the male growling voice and the female clean one. Things however change with “Ghan of the Woods” (one of the characters I less liked in the Lord of the Rings book), in which the atmospheres of the forests around the territory of Gondor are well rendered with a nice choice of synth sounds, and the sweet voice of Kaisa Jouhki becomes the leading one, later in the song creating a rhythmic carpet on which the growl of Mykkänen proclaims the glory of the Druidan chief. “Gwaith-i-Mirdain” opens with flute and acoustic guitar on a smooth rhythmic pattern that grows with the addition of electric guitar and bass, as the female voice tells the tale of the greatest artists and craftsmen in all the lands of Arda. The presence of the flute in almost the whole song is a welcomed addition to a graceful song (as graceful as a power metal song may be…). But in my opinion the best song of the album is the following “Trollshaws”. Depicting one of the most dangerous areas of the Western Middle Earth, the song is very well conceived and played, with the growl voice of Mykkänen raging on like the wind among the skeletal trees, as the Trolls themselves become alive in the strange and (I suspect) processed voice you can hear along with a martial flute. Here the female vocals play only a marginal part – maybe even too soft, as the guitars create the true fabric of the song, along with a 3-notes riff of bass keyboards. In all respects this is the best conceived and played (and the most involving as well) song of the album. My compliments to the piano arrangements of Maria! But for those diehard fans of the soft acoustic ballads, the delicious Kaisa expresses all her grace in the next song, “Elves of Luva”, a slow song created on acoustic atmospheres. If you like this kind of stuff, you will certainly love this song – honestly a bit unexpected from an “aggressive” band as Battlelore. We return to a more cadenced and heavy theme with “Valier – Queen of the Valar”, as the lyrics move towards the religious aspect of Tolkien myths, and the delicate piano of Maria counterpoints the heavy riffs of Rautio and Vahvanen. Again the main vocals are left to Kaisa, while the bass seems hidden among the distortion of the guitars, and the drums don’t rely on the overexhausted double drums, instead weaving a simple yet efficacious rhythm pattern. A tremolo guitar arpeggio introduces the “Thousand Caves” (Menegroth, if my memory is not failing me…), with a sharp and nervous distorted guitar and a string riff of keyboards that frame the redoubled voice of Kaisa. A nice song that once again manages to rely in music the atmospheres of one of the most famous places described in the Professor’s books. In this song my attention has been almost completely seized by the very nice keyboard arrangements, however. Henri Vahvanen rolls to introduce us to “Cloaked in her unlight”, a hard song which I suspect may refer to the only vampire (a female…) in the Silmarillion (but I may truly be wrong, as I don’t have the lyrics at the moment of writing this review). Almost haunting, this song, is one of the few in which the bass guitar of Timo Honkanen may be at last heard! “Of Orcs and Elves” has a few surprises in for us, among which a splendid slow central section in deep contrast with the rest of the song, which is instead built on dark and heavy distortions and a powerful drumming. A carousel of piano and guitars introduces the next song, “Touch of Green and Gold”, which assumes the tones of a ballad but with heavy riffs and a relentless drum pattern, where the growling vocals of Mykkänen in his little but meaningful inserts has true justification. What we have next, “Pallando – Forgotten Wizard I” is a song dedicated to one of the most neglected characters of Tolkien’s works, one of the Blue Istari, called Pallando – one of the two lost wizards, disappeared in the East and according to some unofficial interpretation tainted by the Evil of Mordor (it must be noted that in the digipack limited release there is a bonus track called Alatar – Forgotten Wizard II”). This song is in my opinion the second best of the album, with very good synth carpets, nice duels of vocals, and good guitars and bass with a strong background of drums. As personal considerations, the album is well played but it seems that Battlelore don’t trust the yet good vocal power of Mykkänen, leaving most of the vocal tracks to the exceptionally charming (I’ll never said it enough!) Kaisa Jouhki. This represents a sort of deep difference in style from the previous works of the band – and quite a good thing for the many fans of this beautiful female singer. But the songs lose in power what they gain in grace. Furthermore, the distortion of the guitars is often not very clean, and as a result the bass working is mostly obliterated. However, the work in all is quite good and represents a nice sing that Battlelore don’t seem to sleep on the laurels of their recent success. Again my compliments must go, however, to the excellent drums and keyboards arrangements, which may make the difference in an inflationed genre such as the power metal. I strongly suggest this album for both the fans of Tolkien and of power metal, and to the fans of Battlelore outside there I say that you can blindly trust in this album, it won’t disappoint you. But for those who don’t know yet Battlelore, I suggest to listen to some of the previous works before entering this “Third Age of the Sun”, in order to better understand what is behind this good work.